Ukraine president Viktor Yanukovych left his private residence in Balaclava, in a hurry last and for an unknown destination. Mr Yanukovych was deposed by parliament last Saturday after months of bloody unrest. The estate he abandoned is lavish and luxurious, with some newspapers openly defining it as 'fit for a tyrant'. 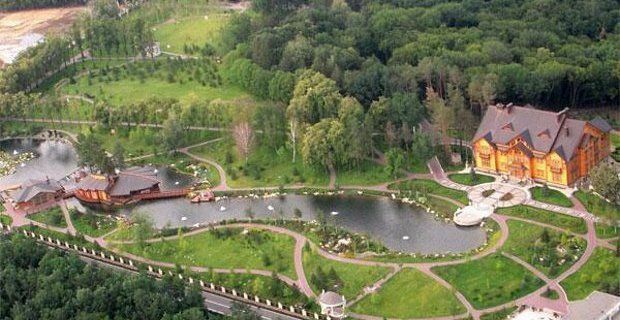 Set in the beautiful countryside outside of Kiev, the 343 acre estate features a private petting zoo, golden toilets and even a full size pirate galleon, which incidentally floats in a lovely man-made lake. At the news that Mr Yanukovych had fled, protesters, journalists and common people gathered to explore his mansion and what they found did not fail expectations: just as they imagined, the luxurious home of their deposed president is a monument to money, power and corruption. At first, people were astonished at all that land surrounding the palace, enough to be considered a miniature park. A part from the above mentioned Spanish galleon and the zoo – including pigs, antelopes, bears etc, the mansion itself quite strikingly reminds a sort vernacular Edwardian style, but in such a bigger scale to result imposing and ridiculous at the same time, if that's ever possible. Covered in wood, the mansion is also reported to have costed £300 million to build. Too opulent to be tasty, the interiors of the mansion feature a hell lot of marble, and gold of course: anything that could possibly be gilded was gilded, be reassured. And loads of glass, in the form of chandeliers and mirrors that feature in every single room, plus the crystal drinking glasses in the panelled bar, complete with personalized vodka bottles! But the opulence is not limited to the dreamy interior decoration: with a casino, banqueting hall, an ultra kitch sauna in the 19th-century Palace style, Mr Yanukovych really had more toys than he could ever play with – in fact, they were rather there to show off, of course.